Well after seeing the large commercial roasters, I started thinking why not a smaller residential size roaster… So I went to the internet and didn’t find much! The research & development started. I got myself some materials and began to cut, bend, weld, and grind and came up with a crude roasting basket to fit on my grill. 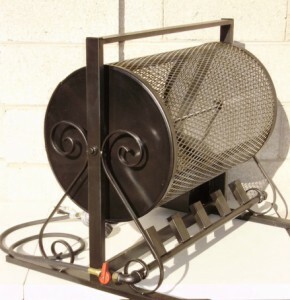 I finally came up with a unique, well-made, versatile roasting basket that will fit on almost any BBQ grill. A friend of mine put the idea in my head that I should sell my roasters. I started advertising and created a very simple website. After a few responses, I was asked if it I had a roaster with burners. Well, back to research and development… And again made a few crude frames with burners. They were not very appealing, but it was a start. After months of cutting, bending, welding, grinding and hours on the internet researching and looking for the parts & materials I needed, I finally came up with a marketable product. This product has now evolved into 5 different roaster models that are not only practical but also have an artistic design to them. These roasters were developed for the homeowner to the executive chef in mind for quick and efficient roasting of not only green chilies but a wide variety of vegetables. AZ Sonoran Chile Roasters is a 2 man operation of superior quality roasting equipment. We have a fully operational facility where we fabricate everything in-house, using all American-made metal. We generally only have 4 of each roaster on hand to ensure quality and reliability. There may be a wait during the times of July-Sept, please be patient with us and we strongly suggest to order early. Ordering early would ensure that you get your superior quality roaster in time for Chile season. We do try and keep as much inventory on hand as possible and try to accommodate every order in the most timely manner possible. Improvements through R&D include high output, very efficient burning that is almost pure blue with little to no yellow flame. The El Diablo now has a spoke and chain drive thanks to construct criticism from some of our favorite customers. Although we strive for improvement in all of our products, we also strive to keep our prices competitive with the rest of the market. As always, we offer the best Fed-Ex shipping rates and work to get the best possible rates for our customers. We would like to offer free shipping though we will not cut corners on the quality or materials of our product. Our website is secure and offers user-friendly payment options and PayPal payment plans. Our roasters have been purchased by some of the biggest produce companies around and are in use in their stores all around the country.